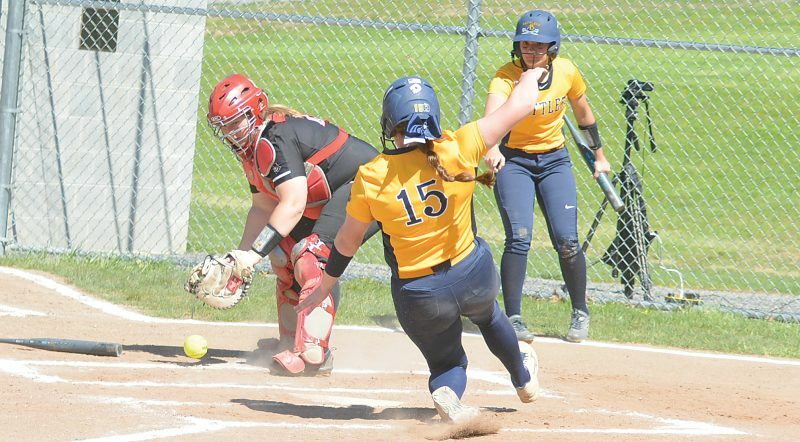 The Inter-Mountain photos by Tony Baisi Philip Barbour’s Abby Weingart places a shot on goal during Wednesday’s match against Petersburg at George Byrer Field at BC Bank Park. The Lady Colts rolled to a 17-0 victory. 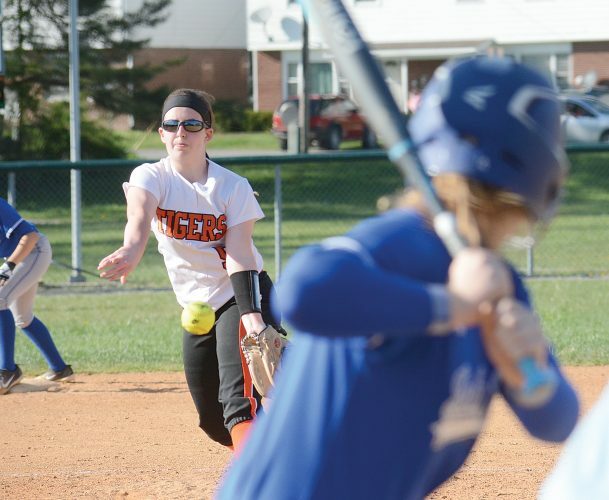 PHILIPPI — With a pair of hat tricks in tow by Braylynn Travis and Hayley Gribble, Philip Barbour routed regional foe Petersburg, 17-0, on Wednesday to improve to 1-1 at George Byrer Field at BC Bank Park. A total of 11 different PB players recorded goals during the contest. Travis dented the scoreboard early with two goals in the first 10 minutes of action. After Abby Weingart deflected a score in, Gribble dribbled in and made it 4-0. Graylin Floyd’s corner kick then resulted in Payton Gregory’s goal. Defensive player Brittany Lawrence then found her way into the attack zone to help ratchet the Lady Colts lead to 6-0. 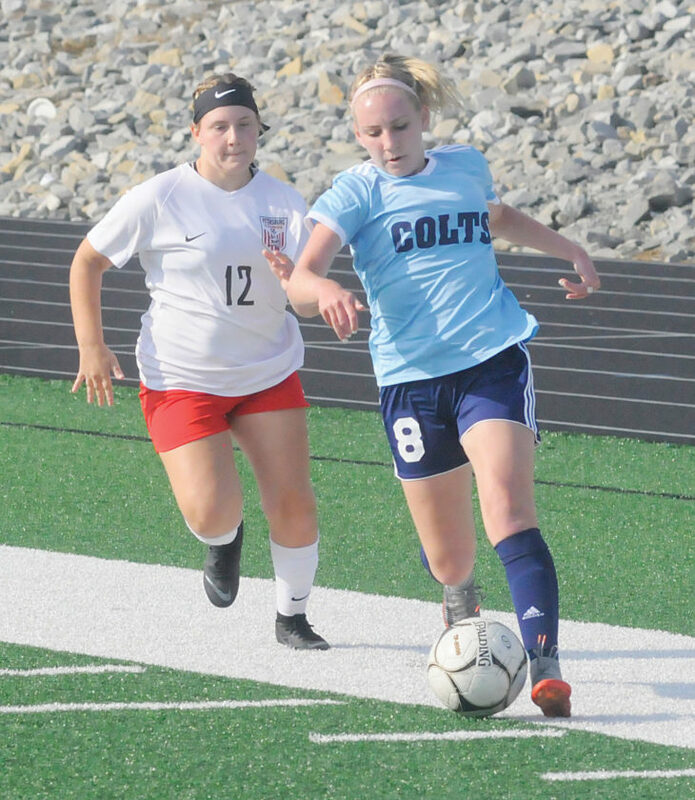 Weingart scored again with two minutes left in the first half, and Kaitlyn Marsh booted in a Colts’ goal with 18 seconds left to help PBHS take an 8-0 lead at the half. 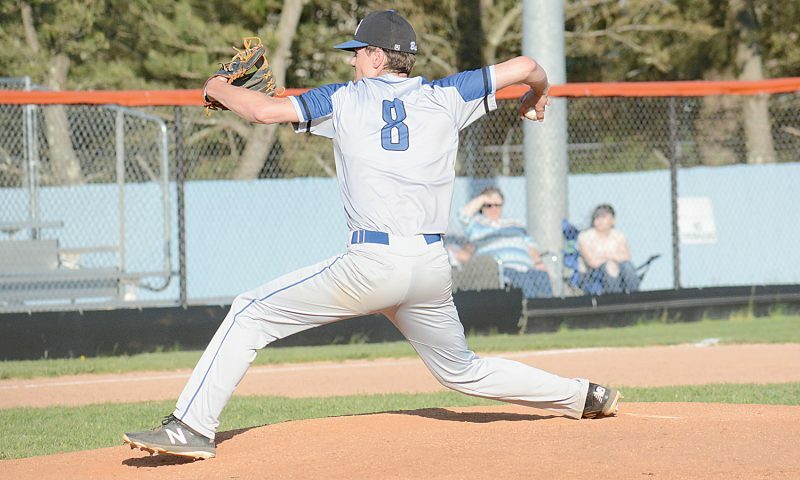 PB’s Payton Gregory (8) gets some separation from a Petersburg player. Travis punched the scoring column for the third time with less than four minutes gone on the second half clock when she took a deflected shot by Gregory near the the Vikings’ goal back into the net for good. Gregory scored again, and Travis assisted Gribble for a 12-0 advantage belonging to the hosts. Gribble reached hat-trick territory with 28:51 left in the game. Chloe Freeman grabbed a rebound after Petersburg blocked Audrey Williams’ shot on goal and put it back for a score. With 13 minutes to go in the contest, Katriana Beckwith found pay dirt behind the north end zone at the Colts’ Corral. Lawrence capped the scoring of with under six minutes left in the match. Philip Barbour recorded over 90-percent possession time throughout, taking 33 shots on goal compared to less than five shots on goal by a young Petersburg squad. 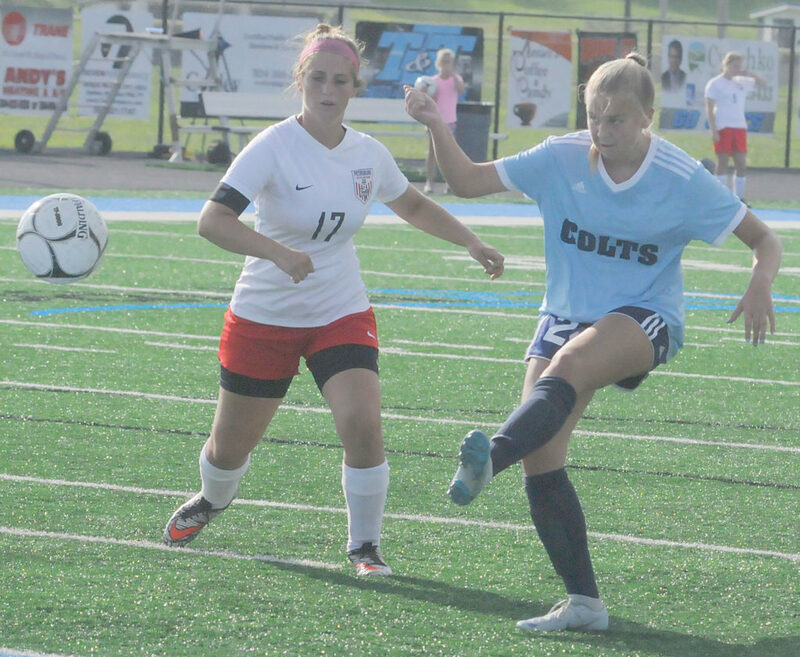 While on the attack, the Lady Colts lined up five corner kick opportunities as well. For the Lady Vikings, first-year player and starting goalie Tiffany Paugh stood tall for 13 saves in the first half. Petersburg junior Jalyn Western was tasked with several free kicks after out- of-bounds shots from PBHS. Philip Barbour will resume Big 10 Conference play at 7:30 p.m. today with a scrum at Liberty.